Last Friday, at the World Economic Forum in Davos, Switzerland, Rupert Murdoch sat on a panel where he lamented what he described as a “loss of power” due to the ascension of the Internet and other new media. The notion that this captain of one of the most dominant media conglomerates in the world is trembling in the shadow of bloggers is simply absurd. Especially when you consider the fact that his company is also a dominant player on the Internet with an aggressive acquisitiveness that includes MySpace, the world’s largest online social networking site. But there was a more shocking exchange that took place that ought to have caused more of a stir amongst professional journalists and all freedom loving people. It was an exchange that revealed something that most conscious beings knew, but which I have never seen explicitly articulated. 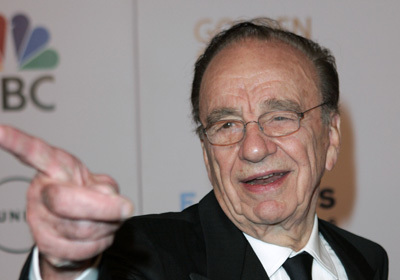 Murdoch was asked if News Corp. had managed to shape the agenda on the war in Iraq. His answer? Setting aside the nonsense that they had ever been critical of Bush’s adventures in Baghdad, having confessed to being deliberatly deceitful raises some questions. For instance, how can anyone ever again take seriously Fox News or any of Murdoch’s other instruments of bias? How can News Corp. continue to pretend that they are “fair and balanced?” How can any other media company exhibit the slightest expression of respect or patronization? And speaking of other media companies, where are they now? The Chairman and CEO of a media empire that includes the number one rated cable news network, and numerous newspapers around the world, has just admitted that he tried to use that empire to “shape the agenda” in support of a partisan political goal with consequences of life, death, and global destabilization. Why has the media, who you might think would have some interest in this subject, virtually ignored these remarks? We know they were there because, on the very same day, there was a media tempest over remarks by John Kerry on whether Bush had turned the U. S. into an international pariah. That trumped up commotion was led, of course, by Fox News. Even the Hollywood Reporter downplayed the most startling portion of Murdoch’s presentation by headlining their story: “Big media has less sway on Internet.” They apparently felt that that was a more weighty revelation than the attempted thought-control exposed by Murdoch. Where is the outrage? Where are the calls to disband this mammoth and unlawful propaganda machine? Murdoch, who was made an American citizen by an act of Congress because, otherwise, he could not own an American television network, should have his citizenship revoked and be deported back to Australia. Think of the precedent this sets for any other wealthy and ambitious ideologue that seeks to manipulate public opinion. There are plenty of wealthy and ambitious ideologues in the Middle East and elsewhere who may view Murdoch as a role model. At the very least, it needs to be broadcast far and wide that News Corp. and Fox News are nothing but a tool of the neo-con operatives in government. You might say we already knew that, but this is different. We are not merely accusing them of this stance, they have now admitted it. And it can not be tolerated! Not by any standard of journalistic ethics. Not by a nation that values a free press so much that it incorporated that freedom into its Constitution.